The Android 2.2 mobile operating system, which Google announced last week, is already hitting some of the first Nexus One models, ahead of many other Android phones. Twitter and blogs are abuzz with user reports of the latest version of Android (2.2) available as an over-the-air update for some Nexus One users, bringing several new features such as Internet tethering, WiFi hotspot capabilities, and full Adobe Flash support. The first reports of Android 2.2 on Nexus One devices came this weekend, when TechCrunch's MG Siegler received an e-mail from Google saying: "The rollout to Nexus One devices has begun!" It appears the first ones to receive the update were members of the press, who received a free Nexus One device at its introduction in January. All other Nexus One users should start receiving notifications on the availability of the 2.2 update "in the coming weeks," according to a blog post from Google's Xavier Ducrohet, the Android SDK Tech Lead. If you haven't rooted (as in hacked) your Nexus One phone, you don't have to wait for your turn for Google to push the over-the-air update to you. The Phandroid blog has posted a list of eight steps for Nexus One users to trigger a manual update to Android 2.2 -- though it doesn't look like an easy method for novice users. 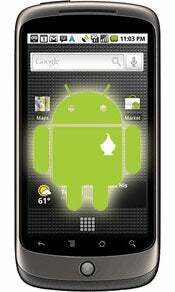 Motorola Droid users should get treated to Android 2.2 "in the near future" as well, according to a company statement over at Slashgear. Motorola did not mention any specific dates for the arrival of Android 2.2 on the Droid, but keep in mind it took Verizon over three months to deliver version 2.1 to Droid models on its network. Finally, Android phones running on HTC's customized Sense UI will be among the last to upgrade to 2.2. The HTC Desire, Droid Incredible and EVO 4G are set to go Android 2.2 "in the second half of the year," according to sources within HTC quoted by Pocket Lint.